SJ Wolfe Racing enjoyed a fast start to the 2017/18 Great Southern racing season by saddling up a winning double from 11 starters at Mt Barker today. Three-year-old Cleo's Afterparty held on gamely to defeat fast-finishing stablemate Margays in the Bruce Williamson Memorial Maiden (Race 3-1200m), thanks to a positive ride from Peter Hall. The son of Magic Albert was stepping out for the first time since an Ascot debut on April 26 and appears to have a bright future, as does three-year-old debutante Margays, who rattled home from last on the turn. Enigmatic five-year-old Gauged (pictured) was the second leg of the Team Wolfe double, coming with a strong finishing burst for jockey Peter Knuckey to score an upset victory in the Plantagenet Sheds And Steel Handicap (Race 7-1300m). 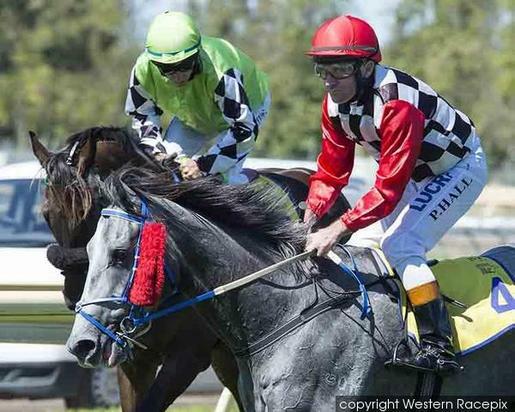 The 2016 WA Derby fifth placegetter had mixed up his form when last in work, however, he returned to racing in dominant fashion today in what was arguably a career-best performance. Stablemate Mass Effect was sent out the $2.70 favourite, however, he was held up behind heels for the entire straight and simply had no luck at his first-up appearance. Certainly a horse with plenty of upside and worth following closely second up.